Have you ever wanted to visit African savannahs and feel the beat of drums? The great news is that you can set off on such an adventure wherever you are thanks to safari-themed slots brought to you by some of the leading software providers in the industry. Join the herds of imposing wild animals and hit some big wins as you play with some of the best mobile slots using this exciting theme. 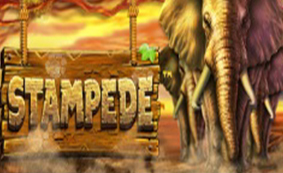 Launched in 2017, Stampede is a Betsoft-powered video slot that uses a 5×4 layout and offers no less than 1,024 ways to win. Take a trip to an African savannah crowded by wild animals roaming in herds and you can enjoy wins piling up with a maximum possible payout of 769,500 coins in a single spin. All you have to do to win a prize is to match gazelles, giraffes, zebras and elephants on adjacent reels in succession with no worries about landing them on paying lines. The biggest draw of the game is its free spins feature with Wilds doubling and tripling payouts whenever they are included in a winning combination. Multipliers are awarded at random and they multiply each other if two or more contribute to winning combos. That means that your payouts can be increased by up to 27x since Wild appears on the reels 2, 3 and 4 only. What makes this slot so special? Betsoft is well-known for their 3D slots and although Stampede is not as impressive as their other titles, it still boasts animated elephant symbols that appear in stacks on the reels to provide you with large payouts. In addition, a total of 1,024 ways to win and a chance to win up to 769,500 coins in single spin make this game worth your attention. You can easily guess from the title of the Pragmatic Play 2018 release that its biggest star is the rhino, an imposing animal roaming the sun-drenched savannah. Don’t be afraid to meet him as he can make your bankroll soar. Other African wild animals appear on 5 reels and 20 paylines too, so create winning combinations with crocodiles, flamingos, cheetahs and meerkats on the go and hit up to 500x your bet. The Great Rhino slot benefits from Wild, which is the top paying symbol in the game, the free spins feature awarding 10 free games with rhino symbols assuming the role of Wild and the Super Respin feature, which is the highlight of the game. It is triggered by 2 or more stacks of rhinos that remain on the reels during 3 respins awarded initially. Whenever a new rhino symbol appears, it awards a respin and if you manage to land 14 or 15 rhino symbols on the grid you can win a Major or Grand Jackpot respectively. The two fixed jackpots make this game stand out from the crowd. While the Major Jackpot is worth 375x your stake, the bigger one will give a 500x your stake boost to your balance. The NetEnt title will take you deep into the jungle where you can feel the call of the Wild. It uses 5 reels and offers from 243 to 1,024 ways to win, meaning that you will win as long as you land identical symbols on adjacent reels. Jungle Spirit: Call of the Wild boasts outstanding 3D graphics with an animated backdrop and symbols coming to life when included in a winning combo. Cobras, bears, elephants, crocodiles and tigers populate the reels and award payouts going up to 182,500 coins. The slot comes packed with bonus features including the Symbol Expansion feature with icons marked with butterflies expanding to cover the reels completely when included in a winning combo. The Butterfly Boost feature can be activated at random during the base game and it makes 1 to 5 symbols included in a win expand to cover the reels fully. During the free spins feature, you can create winning combos in staggering 1,024 ways. Depending on the animal you choose, you can get between 4 and 20 free spins. The free spins feature can provide you with large wins with the chosen animal appearing frequently on the reels. If you want to risk for a chance to hit higher payouts, choose a more lucrative symbol with fewer free spins. Another slot that takes you on a trip to Africa is the Playtech title Safari Heat. Played at a 5×3 grid and 15 adjustable paylines, the slot features plain dark brown reels with icons depicted as wild animals and playing card symbols in vibrant colours landing on them. Although this is the title with the least polished graphics on the list, the backdrop of the reels representing a savannah in sunset looks gorgeous and tempting. In terms of bonus features, the Playtech product is pretty basic, yet its top fixed jackpot of 10,000 coins makes it worth your time and money. Wild that pays the top prize and replaces all symbols bar Scatter also acts as a 2x multiplier whenever it is included in a winning combo. You can also trigger 15 free games with all payouts trebled. On top of that, the feature can be retriggered indefinitely. The Gamble feature is available too, allowing you to double your winning by guessing the colour of a hidden card. An opportunity to win huge prizes thanks to Multiplier Wild and free spins awarding tripled wins makes this otherwise basic slot an attractive offering. The Microgaming progressive slot needs no special introduction as it is one of the most popular titles ever. Despite its simple appearance, the safari-themed title featuring 5 reels and 25 paylines is huge with players due to the progressive jackpots ticking away including the Mega jackpot worth millions of dollars. The game’s bonus features include Wild that doubles your wins and 15 free spins with all prizes tripled, just like in the previously described Safari Heat. Four progressive jackpot make the Microgaming 2006 title a must play slot. It is available on all mobile platforms, so give this million-maker a try as soon as possible wherever you are and you can be the next big winner.